BCBG: Get 50 percent off holiday must-haves at BCBG. Bealls: You Pick: take $10 off your $25 order OR 15% off no min with the code PUMPKINPIE from 11.27 to 11.29! Plus receive free shipping on orders $50+. Find the best deals at BeallsFlorida.com. Betsy Johnson: Save 33 percent plus free shipping at Betsey Johnson with code BLACK. Bloomingdale’s: Save up to 50 percent off sitewide, and take $25 off almost every $200 purchase with free shipping and free returns at Bloomingdale’s through Nov. 30. Designer Handbag Sale at Bloomingdale’s! Save up to 30 percent on designer handbags through Dec. 7. C. Wonder: Save 40 percent site wide at C. Wonder. Calvin Klein: Get free shipping at Calvin Klein and save 50 percent on everything at Calvin Klein Outlet. Charlotte Russe: It’s buy one, get one free at Charlotte Russe. Buy one, get one free with $5 dresses and $5 shoes. Charm & Chain: Save 30 percent sitewide (some exclusions may apply) Charm & Chain with code GIVETHANKS. Converse: Save an additional 25 percent at Converse with code 25MORE through Nov. 30, and save even more with free ground shipping through Dec. 19. Delia’s: Use code BFSALE for 50 percent off everything and free shipping at Delia’s. Dooney and Bourke: Buy more, save more and get 20 percent off $200, 25 percent off $300 and 30 percent $400 at Dooney and Bourke. DKNY: Get 20 percent off sweaters & outerwear at DKNY. East Dane: Save up to 25 percent at East Dane with code GOBIG14. eBags: Save up to 70 percent at eBags. Forever 21: Black Friday deals at Forever 21. Guess: Get 30 percent off regular price styles, 50 percent off select regular price, and an additional 50 percent off reduced styles at Guess. J Brand: Save 30 percent at J Brand with code BLKFRI2014. J.Crew: Get 30 percent off select styles at J. Crew with code HOLIDAY. Also, enjoy 40 percent off sale items at J. Crew with code HOLIDAY and today only, get free shipping. Lee Jeans: Black Friday – Get up to 50% Off, plus an additional 15% off $75 and Free Shipping! No code required – Valid 11/28 only. Loft: One day only Black Friday Travel Flash Sale! Get 50 percent off your entire purchase at Loft with code TREAT. 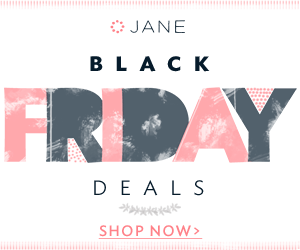 ModCloth: Black Friday Sale! 50% off New Arrivals! Nasty Gal: Save 30 percent on select items at Nasty Gal. Net-A-Porter: Enjoy up to 50 percent off at Net-A-Porter. PacSun: Save 20 percent on regular price and markdown items plus get free shipping at PacSun with code GIFTS20. Pottery Barn: Save 30 percent on one item at Pottery Barn. Saks: Save up to 60 percent off select styles at Saks. Sole Society: 30 percent off plus free shipping at Sole Society. The Dreslyn: Save up to 70 percent off sitewide at The Dreslyn with code BLACKFRIDAY. Vera Bradley:Spend $125 and get the cherry blossom collapsible duffle atVera Bradley. Victoria’s Secret: The retailer is offering tons of great deals over the weekend, so be sure to check them out. Bloomingdale’s: Designer Handbag Sale at Bloomingdale’s! Save up to 30 percent on designer handbags through Dec. 7.